Formed as a reaction against the retrogression of the music climate, THE AMENTA has breathed new life into ‘extreme metal.’ The Australian quintet’s critically acclaimed sophomore album, n0n - which mixes intricate guitar riffs, gut-wrenchingly scathing vocals, and avant-garde ambiance - has made a huge impact in Europe, receiving raving reviews in Metal Hammer, Kerrang!, and Rock Sound magazines. n0n is the soundtrack to a modern age. Formed in 2000 by guitarist Erik Miehs and sampler Timothy Pope, THE AMENTA quickly came to embody a new movement in both the worldwide, and local extreme metal scenes. Fusing industrial noisescapes, brutal distortion, and mind numbingly complex riffs, THE AMENTA defined its distinctiveness early in its career. The band recorded and released the Mictlan MCD in 2002. Four tracks depicting mourning and intellectual decay set to unsettling industrial ambiance: Mictlan set the standard for THE AMENTA’s future releases. In addition to excellent reviews and significant praise across the globe, the MCD also gained the attention of France’s Listenable Records; in turn, setting the stage for the evolution of THE AMENTA from a local band to a group of professional artists. Listenable Records released Occasus, the band’s 2004 full-length debut, worldwide. The album was recorded and mixed by Lachlan Mitchell and THE AMENTA at Room of Doom Studios, Que Studios, and BJB Studios in Sydney and mastered at Studio 301 by Steve Smart. The ten-track epic, which touches on themes of revolt against tradition; human stagnancy; slave society fostered by religion and socio-political dogma; consists of masterful riffing and melancholy ambiance. Occasus was received by the media with raving reviews, and by the end of 2004, THE AMENTA tied for second place in Terrorizer Magazines’ ‘Best New Band” category, and won “Best New Band” from Australian Kerrang!. Between the release of Ocassus and 2006, THE AMENTA toured Australia three times: opening for Alchemist, Behemoth, and as a headliner. In 2005, Mictlan was released on limited 7” vinyl, and Ocassus was re-released as a limited edition with a bonus “Virus” DVD/EP in 2007. 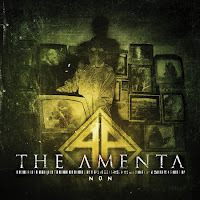 THE AMENTA returned to the studio in late 2007 to record their sophomore effort n0n. Rather than relying on the clichéd sound and style in which other bands are content to wallow, THE AMENTA has constructed an album built on new ideas, concepts, sounds and techniques. n0n is the fusion of white noise, shards of dissonant guitars, and dense layers of radio chatter. Lyrically, n0n is a newscast, contextualizing the listener into his vice-driven society with suicide bombers and evangelists: freeways, and dead ends. n0n is an indictment on today’s media and technology addicted hyperactive society. With each song featuring over 100 instrument and sample tracks, the album pushes technology to its absolute limits. The recording of n0n spans many countries and seven different studios, with a myriad of different contributors and performers including Jason Mendonca (Akercocke), Alice Daquet (Sir Alice), Alex Pope (Ruins) and more. Fusing the ugliest parts of extreme metal, electronic noise, and dub; with a ferocious and scathing world view, n0n is the future of extreme music! In October 2007 THE AMENTA toured Australia with The Berzerker. Due to overwhelming success and demand, the two will once again tour Australia and New Zealand in January 2008 on the Industrial Corruption Tour. n0n was released in Europe on 20 October via Listenable Records, and will be released in North America on 10 February 2009. THE AMENTA will hit European shores for the first time, supporting DEICIDE and VADER on the Winter Fest 2009 tour. THE AMENTA will deliver unrelenting brutality on a massive scale to dissidents worldwide, while redefining death metal.